Should throwing a record seven touchdown passes in one game and delivering the most magical postseason performance by a backup quarterback that the NFL has seen qualify Nick Foles for the Hall of Fame? The National Baseball and Pro Football Halls of Fame will hold their induction ceremonies soon — the former, next week; the latter, the following week — and their proximal timing isn't the only thing that links them. As compared with, say, the Naismith Memorial Basketball Hall of Fame or the Hockey Hall of Fame, baseball and football's Halls always seem to have some controversy swirling around them when it comes to the selection of their inductees. The same is true this year. Though baseball's class – which includes former Phillies first baseman Jim Thome – has inspired little to no outrage or argument, the first weekend in Canton will be a bit unorthodox, thanks to (surprise, surprise) former Eagles wide receiver Terrell Owens, who plans to skip the festivities because he was voted into the Hall on his third appearance on the ballot and not his first. One of the reasons, maybe the main one, that such hullabaloos arise more often in baseball and football is that those Halls of Fame give two sportswriter organizations primary roles in the selection processes. The Baseball Writers Association of America holds an annual Hall of Fame vote, and members of the Pro Football Writers of America gather ahead of the Super Bowl to discuss and determine inductees. The nature of these processes, in turn, leads to more openness and debate about the selections. A "Why I Voted for This Guy But Didn't Vote for That Guy" column is a rite of passage for a baseball scribe, and those football writers who are in the room when a Hall class is chosen often publicly explain and/or justify why certain candidates did or didn't make the cut. That's why Owens, for example, is so ticked off that he had to wait so long to get in. It's not just that he deserved the honor as much as or more than other candidates who were first- or second-ballot inductees. It's that he could listen to voters and other influential football people tell the world why they didn't think he deserved it. Terrell Owens always loved the spotlight, but he won’t be heading to Canton for his Hall of Fame induction. Personally – and I've said this before and stand by it – I don't think someone who presents himself or herself as an independent journalist should be involved in determining who is and who isn't a Hall of Famer. Once you directly affect the process, you're no longer independent of it. But neither Hall seems inclined to alter its selection procedure any time soon, and Lord knows, we sportswriters aren't about to surrender two of the few sources of (relative) power and impact we still have. To paraphrase Jerry Seinfeld, we're going to hold on to them like grim death. One, a particularly significant individual achievement or period of achievement – even if it is relatively brief, even if it is an outlier in that athlete's overall career – should be enough to warrant induction. If the long-term excellence of, say, Craig Biggio or Don Sutton deserves immortality, why doesn't the short-term incandescence of Don Mattingly or Dale Murphy? Roger Maris hits 61 home runs in one season? In. Don Larsen pitches the first perfect game in World Series history? In. Curt Schilling and his handful of dominant and clutch playoff performances? In. Football careers tend toward brevity already (which is why Gale Sayers and Terrell Davis were still easy Hall of Fame choices), but the principle would remain there, too. The Rams' Flipper Anderson set the NFL single-game record for receiving yards, racking up 336 against the Saints in 1989. That mark still stands. Should he get into Canton for it, for that one day of pure greatness that hasn't been eclipsed in nearly 30 years? 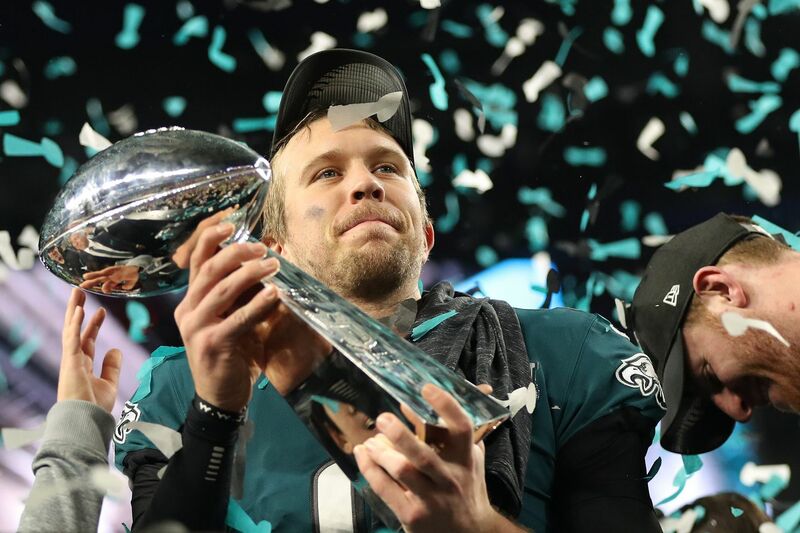 What about Nick Foles, who threw a record seven touchdown passes in one game and later delivered the most magical postseason performance by a backup quarterback that the NFL has ever seen? Those would be fun debates. Two, if media members are going to pick the inductees, then the popular and/or cultural impact of particular players and moments in each sport's history should be part of the criteria. Why? Because it is through the media – writers, broadcasters, historians, the rising tide of social media – that such moments remain at the forefront of our collective consciousness. Bobby Thomson and The Shot Heard 'Round the World. Dwight Clark and The Catch. Kirk Gibson in Game 1 of the 1988 World Series. David Tyree in Super Bowl XLII. All of them and more should be considered, if not inducted. And the upshot is, at least one of them would probably show up to the ceremony.